I’ve been thinking about getting the Skyberg covers redesigned for a long time. It’s been so long since I published Below Zero I wanted to inject a bit of excitement back into the series, and giving Ingrid a whole new look seemed like a great way to make readers (and me) excited about Skyberg again. When the early books in the series were first published in 2014, Eva was going through treatment and although she was immensely proud of them at the time, the covers probably didn’t get the attention they deserved. Enough time has now passed since Eva died for me to look at the Skyberg series more objectively, and I decided it was time for an overhaul. But there was a problem. Whenever I looked at photos for the covers, I found the models used by all the major stock photography libraries (Getty, Adobe, Bigstockphoto etc) either had long hair or their lingerie showing! The books make it clear that Ingrid has short blonde hair and spends most of her time in biker gear. That meant I was going to have to commission the portrait photography, and here I got really, really lucky. Over breakfast, I mentioned all of this to my girlfriend she said ‘I know just the person’. So I went to meet the model who’s tall, slender, blond and – like Ingrid – Scandinavian. She also, weirdly, looks a lot like Eva, so much so that when I showed Eva’s best friend the early mock-ups she cried. Now I’ve got used to the similarities, I think it’s really cool Ingrid has ended up looking like Eva. 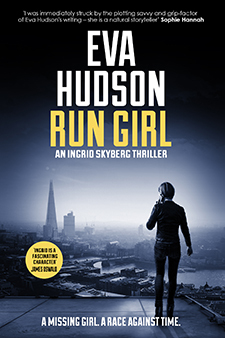 When she created the character, her health was failing, and the weaker Eva got, the more Ingrid could endure. It was impossible not to make the connection between a dying author and her indestructible protagonist, and in the new covers, they’ve kind of become one. As ever when I do anything with the Skyberg series, I ask myself two questions. What would Eva do? And, would she like it? I feel pretty confident that on this occasion I’ve done exactly what she would have done herself, and that makes me even more excited to share them. I’d love to know what you think of the new look. Which is your favourite? Drop me a line or leave a comment below. See, the new ones are way better than these shabby old ones! I like the new covers a lot. My favorite is the one for Deep Hurt. Brilliant! You should be proud of what you’ve achieved – not only on Eva’s behalf – but for yourself as well. Looking forward to the new Skyberg adventure. Thanks Judie. Your continued support means so much. 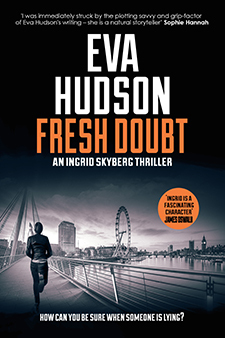 Enter your email address and the first Ingrid Skyberg FBI Thriller will be sent to your inbox. 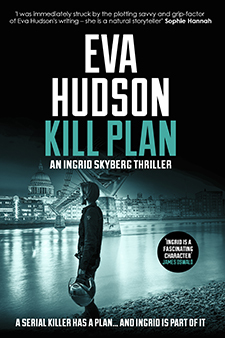 You’ll also be added to Eva Hudson’s mailing list so you’ll be the first to know when a new book in the series is published. Your email address will never be shared with anyone else and you can unsubscribe at any time.